Here's some stuff I've built. Email me if you're especially interested in some of them, if you need more detailed information, or if you build a similar device for yourself. Auroras, or Northern lights, are cool. The Solar storms that cause them also cause geomagnetic activity on the Earth. Thus a sensitive magnetometer can be used to give warning of possible auroral displays. I built a magnetometer using a Honeywell HMC1002 dual-axis magnetoresistive sensor. An LM324 quad op-amp was used in a magnetic feedback circuit (feeding into the offset-pins of the HMC1002) to amplify the signal, which was digitized by an Analog Devices AD974 A/D-converter (a 4-channel, 16-bit, 220 kSPS direct-conversion device, total overkill for this application), which interfaced with the parallel port of an old 486 laptop. 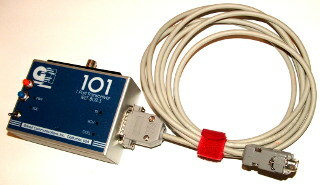 Data was read as fast as the parallel port could serve it, and 1-minute averages were calculated and stored for later use by Gnuplot. This circuit is very linear with respect to the magnetic field, and extremely sensitive. It is also extremely sensitive to temperature fluctuations, so just opening my front door in winter time looks like a tremendous geomagnetic storm. Also no set/reset circuit is implemented, which really should be done to maintain the sensitivity of the magnetoresistive sensors over time. I'll try to find time to do that, and to rebuild the analog section to make it less temperature sensitive. For the time being, here are some sample magnetograms measured with the above circuit. I built this simple, stupid, ugly and extremely heavy equatorial platform for Pollux's 200 mm Skyliner telescope. It is made of particle board, stands on four adjustable feet (hockey pucks stuck onto lengths of threaded rod) and uses a stepper motor to slowly turn the telescope as the Earth rotates. 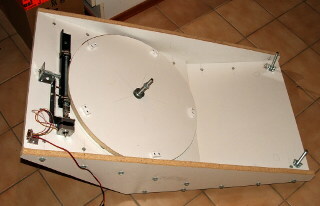 The stepper itself turns a threaded rod held in place with ball bearings, and it is coupled to a strip of polystyrene with matching hot-embossed teeth, bolted to the side of the round particle board disc. The hand control unit is housed in the chassis of an old AUI–10base2 Ethernet transceiver, and it has an on/off switch and pushbutton switches for slewing forward or backward. Here is the schematic and here is the firmware for the PIC16F84 microcontroller, which does all the heavy lifting. 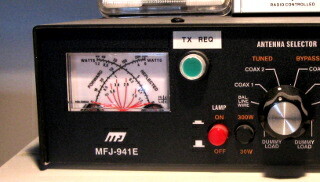 I have an MFJ 941E VersaTuner II in my amateur radio station, which I use to match my antenna to the radio transmitter. 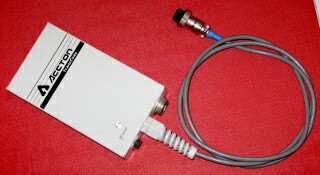 For tuning, the transmitter must transmit a low-power signal on the desired frequency. The procedure is this: Switch from SSB to AM modulation, find the RF power setting in the transmitter's menus, set it to minimum, and press PTT on the mike. After tuning, set the power back to its original setting and the modulation back to SSB. Not very convenient. I built a dedicated "Transmit Request" switch into the VersaTuner, which interfaces to the ACC port on the back panel of the Yaesu FT-897D. The ACC port is a standard 3.5 mm stereo jack, and it accepts a negative-going ALC (automatic level control) signal on its tip connection to allow an external device to limit the output power. There is also a transmit-request signal on the ring connection, which when grounded causes the radio to transmit a carrier for tuning purposes. The sleeve is, of course, ground. I built a circuit which produces an adjustable negative voltage (to set the transmit power) and activates the transmit request on the radio. The switch also has a bright LED so I can't leave it transmitting by mistake. The circuit is built ugly-style directly onto the switch itself. Here is the circuit. The switch with its internal LED (the round green pushbutton in the above photo) is mounted on the VersaTuner's front panel, and a 3.5 mm stereo jack is mounted on the back. 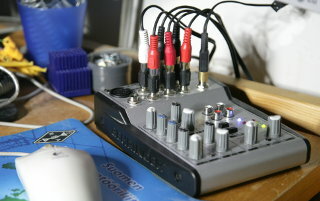 A 3.5 mm male-male stereo audio cable is used to connect to the radio's ACC port. Since the ALC voltage is negative, the station power supply cannot be used to power this circuit. 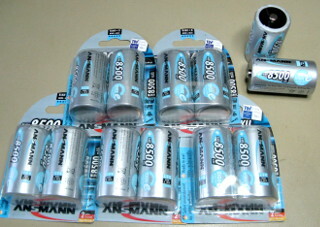 A 9 V battery is used instead. 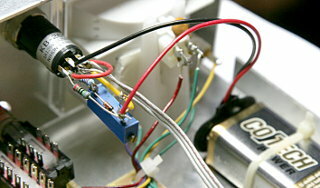 The trimmer potentiometer is adjusted so that the radio's transmit power is suitable for tuning. A zener diode is used to keep that power constant even as the 9 V battery dies. A half-assed attempt is made to avoid RF on the wires (thus the ferrites and bypass caps). With this circuit, tuning is easy: Turn on the TX-Request, tune the antenna, and turn off the TX-Request. Construction and adjustment of the circuit were trivial, only drilling the mounting holes was somewhat tedious, as I had to cover up the switches, air variable caps and other stuff to keep the metal shavings out. Also, the vibration seems to have broken the backlight bulb of the meter. I replaced it with a white LED. I use an LDG Z-100Plus Autotuner in portable operations. To tune, the tuner can request the radio to transmit a continuous carrier, but this is transmitted at full power, causing needless QRM and wear on the tuner's relay contacts. This modification provides a negative-going ALC voltage to the radio's ACC port to limit the carrier power while tuning. I love operating portable with the FT-897. With internal batteries it is also very convenient. But I never was too happy with Yaesu's FNB-78 NiMH-batteries. Especially since the batteries often saw long periods of disuse, their internal resistance was often high. I never could use more than 10 watts power on SSB. So when the batteries finally died, I had to decide what to do: replace them with new Yaesu batteries (or cheaper clones), rebuild the old battery packs with new cells, or something else? 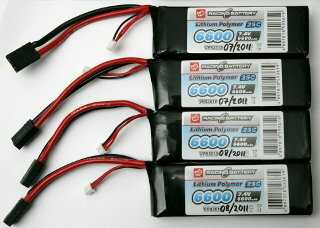 I finally settled on using lithium-polymer (LiPo) batteries, the same kind that are commonly used in radio controlled model airplanes etc. Read more here about the batteries, safety circuits etc.
! ! ! UPDATE ! ! ! The LiPo cells began to puff up after just two summers of light use. Too bad, they were excellent in all other respects! Now I'm looking for another solution to power the FT-897 when portable. I'm currently looking at building an external battery pack from low self-discharge NiMH cells. I'll report here when it's ready. The Yaesu FT-897D transceiver can be fitted with two FNB-78 13.2 V 4.5 Ah NiMH battery packs for portable operation. NiMH batteries are great for this purpose, but they need to see regular use to stay healthy. Mine aren't used that regularly, so I built a discharge circuit which I could use to cycle the batteries every few months or so. Here is the schematic. (Sorry there are no component values. Figure them out yourself, or email me.) The circuit uses a 12 V relay which powers its own coil until the battery voltage falls below a certain threshold, set by VR1. At that point, the relay switches off, disconnecting all circuitry from the battery. While the relay is energized, regulator U2 draws a constant current from the battery, which is simply lost as heat (the chassis of this device, taken from an old AUI–10base2 Ethernet transceiver, is used as a heat sink). A suitable power resistor would work just as well, but I didn't have any on hand, so I used a regulator instead. A LED flashes on the discharge device as well as on the radio, as the battery is being discharged. Sorry I don't have the pinout of the Yaesu FNB-78 battery pack on hand, but if you can't find it on the Internet, email me and I'll peek inside the discharge device which pins need to be connected. The same discharge circuit can be used for other NiMH battery packs as well, as long as the cutoff voltage is properly adjusted. When the pack approaches the cutoff voltage, the relay will make some noise in synch with the flashing LED. Adding a tiny bit of positive feedback (i.e. hysteresis) in the op-amp circuit would make it switch off cleanly. I didn't think of that at the design phase, and haven't been bothered to modify the built circuit (though it would probably only entail adding a single resistor). 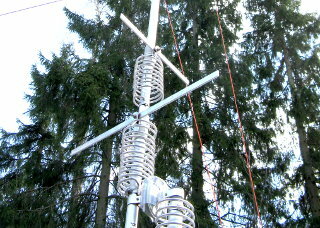 The Butternut HF9V vertical HF antenna is extremely popular among amateur radio operators. I built a copy of this amazing antenna out of aluminum tubes, sheet metal, wires, hose clamps, miscellaneous hardware, and some surplus doorknob capacitors I bought from eBay. The total cost of the project was less than one fifth of the cost of a factory-made HF9V. Details on this project are on a separate page. Quadrifilar Helical Antennas (QHAs or QFHs) are extremely omnidirectional, perfectly circularly polarized antennas that are easy to make and look good. 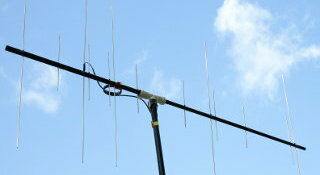 Here is an account of building VHF and UHF versions of this antenna, dualband operation, simulation results of various configurations, and a program to create NEC2 models of QHAs. For portable operation on 2 m or 70 cm, I built this travel Yagi out of a fishing rod. The lower sections of the rod are the mast, and two telescoping sections are the boom. There are five elements on 2 m and eight on 70 cm. 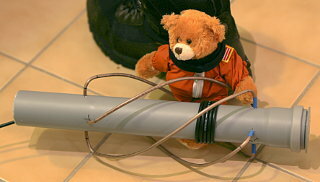 The beam is fed by a single coax, with only a choke balun matching it to the 2 m radiator. 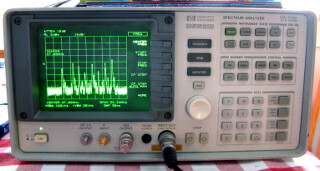 I once acquired a broken spectrum analyzer for free. I still don't know the condition of its "high band" (2.75 GHz and up), but the low band of 0–2.9 GHz came to life just by replacing the front-end mixer with a cheap one from Mini-Circuits. Details are on a separate page. Next I must try to build a tracking generator. I'm designing it around a PLL circuit to directly synthesize a signal for mixing with the analyzer's 1st LO signal. I converted a cheap RF wireless doorbell into a remote trigger for my cameras (my Canon SLRs, and my PowerShot A720 IS which can be triggered via its USB port when running CHDK. Read more. The Behringer Eurorack UB502 mixer (apparently identical to the Behringer Xenyx 502), which I use as a volume control between my PC and stereo amplifier and as a separate headphone amp, had stupid volume controls: The headphone volume was affected also by the "Main mix" fader. So if I turned the "Main mix" fader to zero in order not to annoy my neighbors with loud music, the headphones would go silent as well! I wanted to control the amplifier's volume (via the "Main mix" fader) and headphone volume independently, so I did this modification on the mixer. 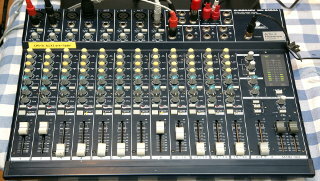 Now the "Phones" fader controls the headphones, and the "Main mix" fader controls the stereo amp. The Behringer Eurorack MX2004A mixer has standard pre-Eq Inserts on its eight mono channels. I wanted to convert half of these into post-Eq Inserts. This enables using four mono channels as independent microphone preamps with equalizers, by taking the signal out via the Insert connector but feeding nothing back. Or they can still be used as Inserts, feeding the audio signal (or some completely different audio signal) back into the mixer. Read more about this modification. I once used a PIC16F876 microcontroller in a custom modification to some industrial process equipment, and wired a 4-key keypad to the PIC through a long cable with very strange results. Read more about what happened and how I finally solved the issue.